I have been getting so many questions from mommies regarding Diastasis Recti and how to treat it. I wrote a HUGE nice long post on DA which you can read here, but now I am back to bring you a Diastasis Recti Workout Challenge to keep you motivated to healing those separated muscles. If you are unfamiliar with this condition, basically it is when your abdominal muscles split in two. 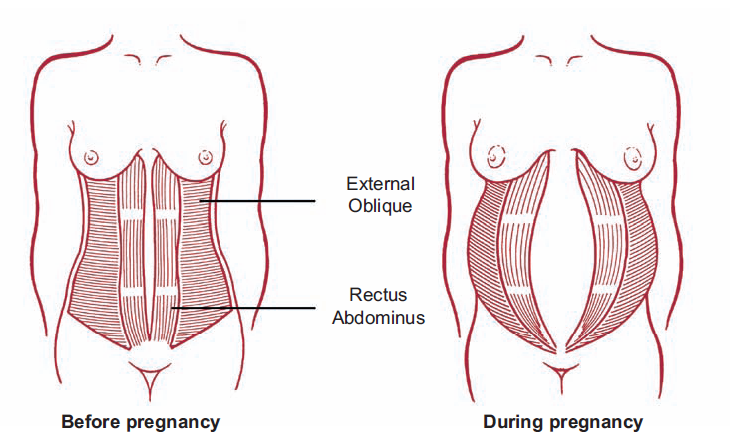 Your abs will naturally stretch apart somewhat during pregnancy to make way for baby. However, a normal pregnancy should result in the abdominal muscles eventually closing back up together with no gaps (which can take up to 12 weeks or longer sometimes). However, when your abs stretch too much, something’s gotta give. Think of a stretchy hair tie. You overuse it or stretch it too much and it won’t go back to being tight and useful. It does not hold your hair in place right? You try to put your hair up with it and your hair falls out in buldges everywhere. Unfortunately 1 in 2 women will develop DA during pregnancy whether it be from natural causes such as the size of your baby, being overweight, or having twins but you can also get DA by doing the WRONG exercises! Basically avoid anything that makes your belly “cone” and puts extra, unnessary pressure on that already protruding tummy. I NEVER worked my abs during pregnancy and thus I have never gotten DA! Sometimes, you cannot help it. But most of the time, you can try. For a complete video of each move along with an example of the DA self test and 3 moves to avoid, watch the clip below and be sure to follow me on Instagram! So, who’s ready? Let’s gooooooo! Here is your pinnable chart. Feel free to hover your mouse over the image to save to Pinterest instantly! Take each move carefully and slowly. Practice deep inhalation and breathing with each move. No repeats! All you’ve got to do is what the day says to do. Stop if you feel any excess pressure or any pain. 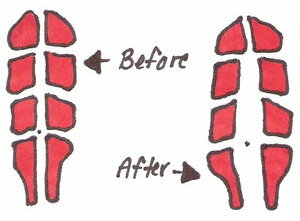 Always consult a doctor prior to beginning any exercise regimine. I have been asked if women with Diastasis Recti can become one of my Strong Body Guide girls-YES, you can! As long as your DA isn’t too severe and you’ve gotten your doctor’s approval, we would love for you to join us. With thousands of women in our private online support group (free with purchase of the Strong Body Guide), we have quite a few ladies with DA whom you can talk to about modying some of the moves and dealing with repairement! 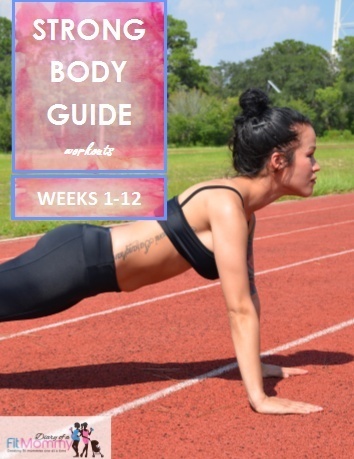 To check out my Strong Body Guide, click here! Tone Your Entire Legs With This ONE Move!